Tabbed interface feature in modern browsers is very useful for multi website browsing with ease. You can tweak tabs using drag drop routine to open them in new window. 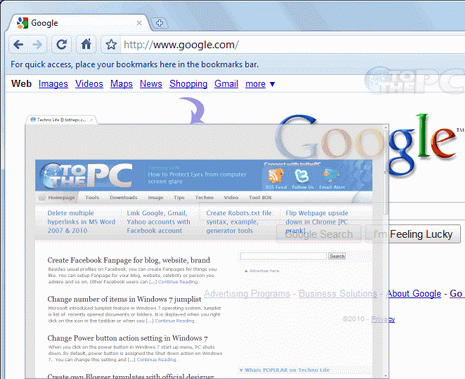 For example: tab with google.com can be dragged to browsing area, this will open new window with google.com and close the original tab in previous window. This tweak works well with all the browsers Firefox, Google Chrome, Opera except Internet Explorer. 1. Select tab that you want to open in a new window.